This is a transcript of a talk given by Professor Hoda Mahmoudi at the opening of the 2019 Diversity and Inclusion Retreat on Belonging: Connections and Challenges. The retreat was hosted by the Office of Undergraduate Studies at the University of Maryland on January 24, 2019 in the Colony Ballroom, Stamp Student Union. Thank you. I want to express my personal appreciation to Dr. Lewis for inviting me to this important gathering. I am delighted to be here today with such a distinguished audience of individuals who are engaged in what I consider to be the most important work on this or any university campus. A program whose mission focuses on meaningful inclusion of all people—all the members that make up our community—this, is truly a vital program here and at any institution of higher learning. Today, there is no greater work to be done than to unearth pathways that can bring all people together to explore and work out their differences, to learn about points of common ground, and to uncover positive actions to construct a better future. The theme for this retreat is “Belonging;” belonging and its implications in the broader framework of Diversity and Inclusion. What a well-timed topic. What a challenging topic. When we belong, we understand. We understand things beyond mere reason, past simple knowledge. When we belong, we draw near to the warming attributes of the human experience. And while belonging need not be about identity, it is about identification. Identification with a place. Identification with a people. Identification from within, into the true nature of ourselves. On college and university campuses we know that a sense of belonging improves student retention, self-esteem, happiness, and academic performance. When students know they are respected, students can grow and thrive as human beings and the whole institution is transformed. When we are able to create an environment that provides for the expressions of unlimited human diversity, we have mastered the art and science of what it means when every person is provided with the opportunity to find his or her highest fulfillment. There is, in my opinion, no greater accomplishment in human endeavor than this. We must also remember that diversity goes beyond identity. People are not different only because of ethnicity, race, nationality, socioeconomic class, sexual orientation, disability status, or creed or religion. People are different because all human beings are different. People are different because of an intrinsic uniqueness of each human soul. Traditional notions of identity can therefore limit our understanding of the true diversity that every person contributes to society. The challenges that confront us at this particular time in our history are colossal; many of these challenges also relate to our need for belonging. Our nation and our world is becoming increasingly fragmented. The forces of racism, factionalism, and nationalism are rising. Once agreed-upon ethical principles of right and wrong are breaking apart. There are more forces of opposition, separation and hostility than there are forces of solidarity, collaboration, and unity. When we look at what is taking place in our country as well as in the world, we see everywhere a crisis of identity and identification. Different groups of people struggle to define themselves. Some are unsure of where they belong in the world. Others are uncertain about what they should believe, who they should trust, and what values they should uphold. In a disjointed society and world, we splinter into countless opposing ideologies, as we lack a shared vision for the present or the future. Without a vision, ideology, identity, and identification becomes a game of thrones, where conflict and violence are used to shut down or destroy the other side. We are witnessing what happens to society as a result of fragmentation and division, as fanaticism grows over the attempt to prove that one group is superior to another. As our own self-definition grows irrationally imprecise and bifurcated, the self-definition of others’ looms as a menacing and foreboding threat. In manufacturing many group identities, we have lost the identity of the group. The outcome of this battle is not difficult to predict. Behaviors that promote separateness, that position one ideology against another, that exclude certain groups of people, in the end, weaken the solidarity of a whole society. If left unchecked, such societies eventually collapse into ruin. These are alarming trends and patterns. They portend a future that is likely to be full of conflict. Universities are not immune to these disturbing developments that are taking shape in society. Indeed, Universities may be viewed, fairly or unfairly, as a kind of patient zero for several of society’s ills. We must regard both peril and potential, sunny possibility and foreboding danger. Our work, as it always has, matters. The way we think, matters. The way we act, matters. Educators and institutions of higher learning have a role to play in society’s path toward human cohesion. The best institutions of higher learning center their energies and resources on creating knowledge and preparing students to serve the community, the nation, and the world. They also prepare students to work on themselves. Those who work in programs of diversity and inclusivity have a unique and powerful responsibility to arrest society’s divisions and fragmentation – not by fostering an ‘us’ / ‘them’ mentality but by reminding others of our shared humanity, our common struggle, our unified future. Those of us who chose to become educators are ever aware that a true education is not simply about instruction, not only about imparting information, facts and figures. A true education must always be a human education, as we discover more of ourselves, and more of the world. Belonging is key to this because belonging grounds our scholastic toil in something far greater – the human need and search for meaning, fulfillment, joy, and peace. Successful learning environments, whether in the University or in the world, reveal the common mysteries, beauties, and treasures of our shared humanity. These environments enable us to bridge the common divide and enter into a social sacred space – a locale of the human family, in which we ourselves play a small, indelible role, unfulfillable by anyone else. Our common definitions – race, gender, age, background, etc – shape us. They offer unique and fascinating prisms into our lives and into the lives of others. But they are maps of an essentially unmapped, unmappable world. Who we are at the core remains undefinable, mysterious, even elusive. It is the role of Universities to provide emblems, narratives, stories, tools – to help the student develop the senses and instincts to live a life worth living. Joseph Brodsky, the Russian-American poet, lived a life worth living. His achievements were academic, with a capital A. He was studious, albeit at a dimly-lit night table in the Russian north, learning English by reading Frost and Auden. He endured “KGB arrests, prisons, psychiatric hospitals, a courtroom trial, and a sentence of hard labor and internal exile”. Joseph Brodsky would eventually argue, long after these days, that a spirit of exile was the condition par excellence – the greatest condition – of the artist, of the poet, of the creative seeker. I agree. I would also argue that it is the condition par excellence of the educator, of the teacher, of the University employee. While exile chafes and grinds down identity, it exhumes and broadens identification. What one experienced alone should aid the eye in seeing others, the heart in seeing oneself. Your self-identifications, alone in a room in the Arctic North will be stripped away, lest you perish. That you are human, desiring to live and see beauty, will endure. This latter truth, shrub-like within all of us, can grow into a broad tree if given proper care and loving attention. I would assert that it is the noble job of educators to be caretakers of the growing souls around us, and that we accomplish this by attention, and by intention. That we ourselves become preachers of a mighty and celebratory exile, equipping students to a great call. We do indeed sing a song of diversity – the diversity of our common humanity, of the celebration of life on other shores, without, and within. We do indeed sing a song of inclusion – the inclusion of the better parts of all we are, and to the better parts of all those we meet, and of all the good work done, and to be done. There was a room beyond reason, Brodsky was asserting. An indivisible cauldron within that no state interest, (and I would humbly add, no academic probes) can ever enter. We must ever remember this. This is remarkable. A man who had been on the receiving end of a notoriously brutal regime asking that not too much attention be paid on wrong’s done. Yet, it seems more than just a do-gooder lesson. It is almost as if his accomplishments – not his poetic accomplishments, but the accomplishments of his soul – were far more valuable in his eyes, than the noxious evils that tried to strangle them. He wanted credit where credit was due – glory to God, not sympathy for the devil. His comments do not ignore evil. They do not understate or undermine the evils of war, deprivation, or structural tribal, racial, or gendered hatreds. But his comments do speak to us today. They remind us of what Dr. Martin Luther King, Jr. has called our “nettlesome task”. The task, and noble task I might add, of equipping young people with salt for the soul, beauty for the mind, life for the bones. Good recipes for what should be a good world, but often will not be. What am I giving them? Today. Tomorrow. What have I given them, that might aid them when trouble truly arrives. Skin-deep self-esteem? Ragged, industrial-made isms, made to last only for a season? I have to ask myself these questions. And they do give me pause. What have I done, what have I said to a young person, that would linger in their minds, or in their hearts, if they were thrown into a situation like a young Joseph Brodsky was? A few of my greatest and latest political opinions? My theories on theories? This is a sobering thought for me. Because the truth is, after 36 hours in the Arctic cold those things will not matter much. She will need a great coat for her soul, a tool, to ply the trade of a gardened good life, whispered words, that speak to greater callings. In the Arctic, in Ann Arbor, in College Park, and to places beyond. Each person matters. You matter. The work you do matters. Let me repeat that. The work you do matters. You are equipping young people for a world that may resemble nothing like we have known. A world that may be defined by evil, by newfound terrors. By war, hatred, unspeakable violence. A world where the fires of love have grown cold. You possess within you, I possess within me, the ability to charge and challenge them, as Joseph Brodsky did, as I am doing to you now. Joseph Brodsky was sustained by a small lamp, and a couple books. His spirit grew, even as his condition worsened. Your lamp is the light of your presence, of your generous and sincere affection for those you have influence with – staff, faculty students alike. Your books are those words, those traditions, those good ideals what we all need reminding of. Be Academic. Be studious. Share them well. 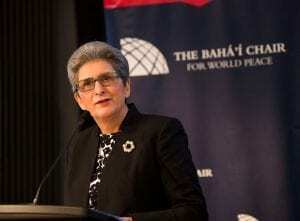 Professor Hoda Mahmoudi holds the Bahá’í Chair for World Peace at the University of Maryland. Dr. Mahmoudi develops a sound scientific basis for knowledge and strategies that explore the role of social actors and structures in removing obstacles to peace and creating paths to a better world. For more information about Hoda: Bahá’í Chair for World Peace website. This entry was posted in Blogpost, Events, Insights, Reflections and tagged belonging, diversity, inclusion, lecture. Bookmark the permalink.